Ring, Ring! It’s Operator 25! 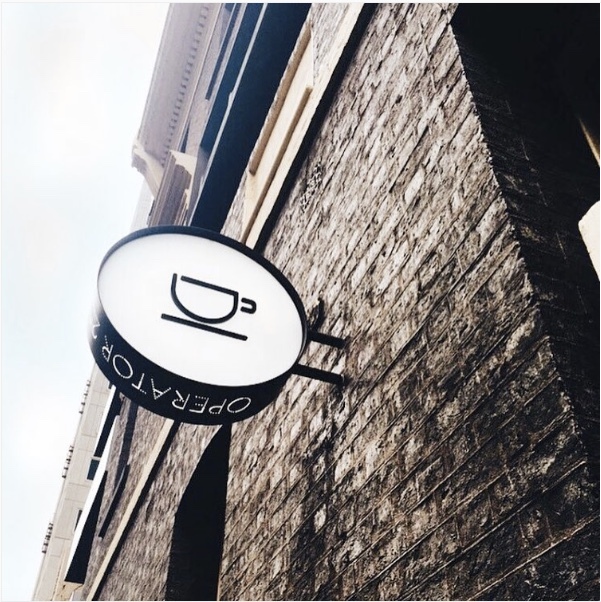 A lot of the restaurants I visit are found on Instagram; sometimes they are hits and sometimes they are misses. Thank God, Operator 25 was a hit! It was also a very welcome break from the numerous assignments I have been submitting. I saw a picture of Operator 25’s matcha almond hotcakes on Instagram and I had to have them. The dish was so beautiful! So one Sunday, I travelled (it’s really me travelling, takes an hour to get to the city centre!) to Operator 25 for what I was sure would be a nice brunch. 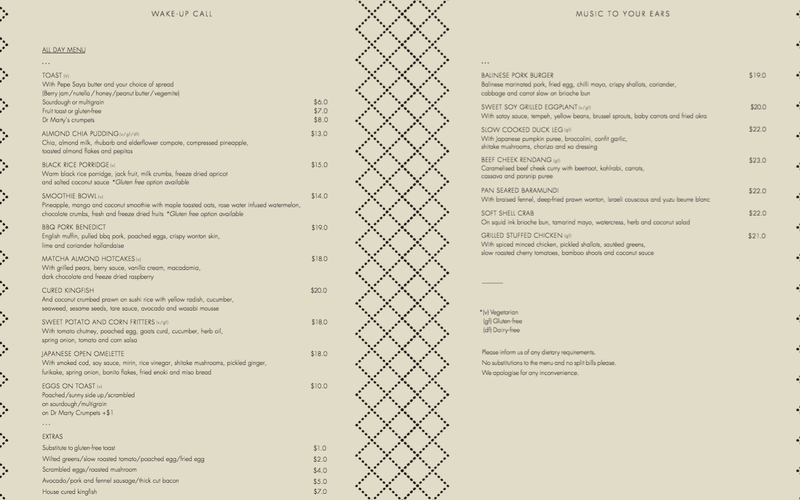 Their food menu is divided into 2, one side has breakfast/brunch-type lighter dishes while the other side has heavier dishes. There is also a nice spread of vegetarian and gluten-free dishes. One thing you’ll notice when you step into the restaurant is the reference to telephone phrases like ‘Hold the line’, ‘Call me maybe’, etc. 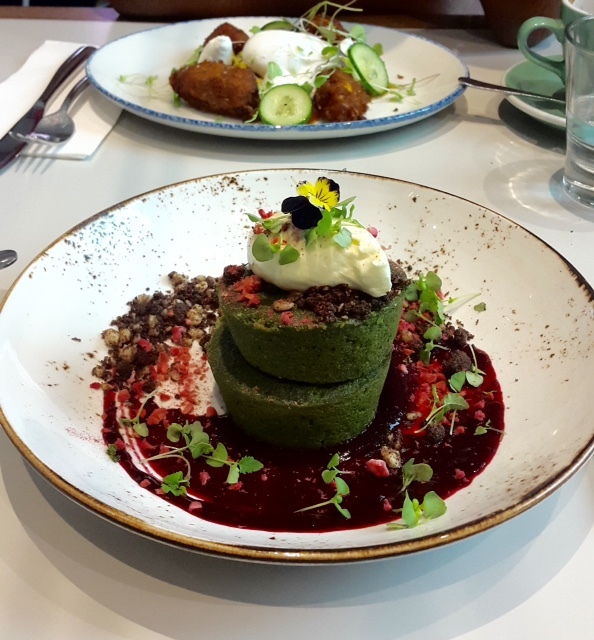 After taking a look at the wonderful dishes on offer, I chose the matcha almond hot cakes, which was why I was visiting the restaurant in the first place anyway. I wanted to get the almond chia pudding as well as I wasn’t sure that I would be filled up but decided against it. My drink was a hot chocolate. They have a drink called ‘Hot Peanutella’ which I’m sure would have been delightful as well. (Chubbydija: “Nutella + peanut butter? Yes, please!”). 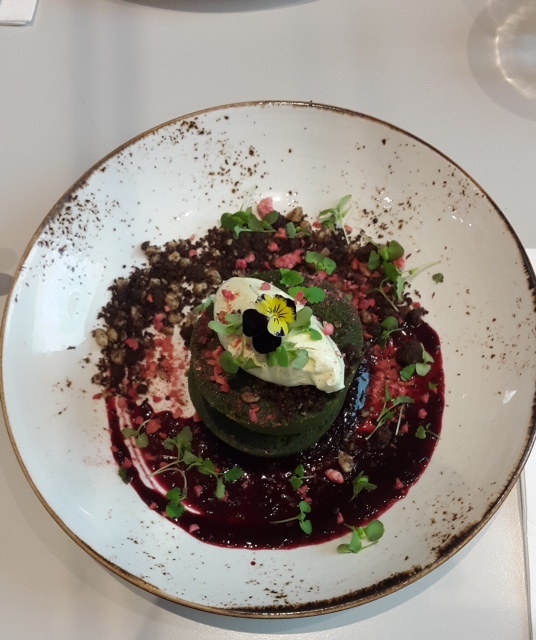 The matcha almond hot cakes were supposed to come with grilled pears, berry sauce, vanilla cream, macadamia, dark chocolate and freeze dried raspberry. 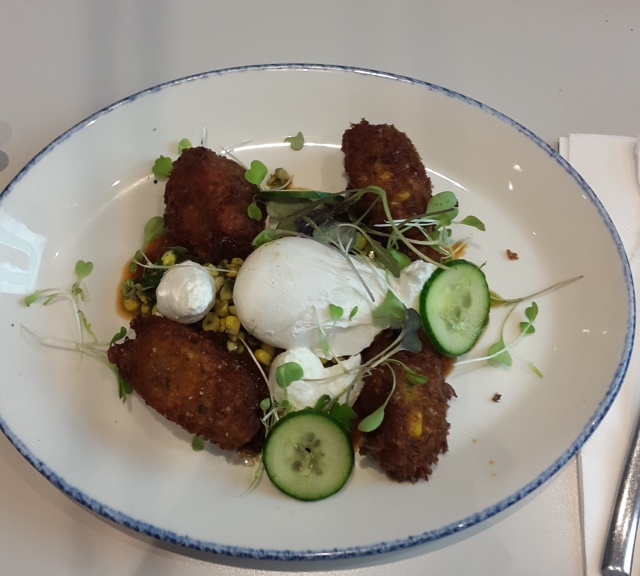 After some confusion, A ordered the sweet potato and corn fritters with tomato chutney, poached egg, goats curd, cucumber, herb oil, spring onion, tomato and corn salsa. I got my order and was pleased with it! Beautiful in person. Yes, food can be given human attributes. This was my first time eating anything with the famous matcha in them. I had also never eaten edible flowers before. The hotcakes had the signature matcha tea flavour, and had the consistency of a sponge cake. They also had a slightly bitter aftertaste. You really couldn’t taste the tea and bitter aftertaste if you paired the hot cakes with the berry sauce. It was a filling dish too! Good thing I didn’t order anything extra. 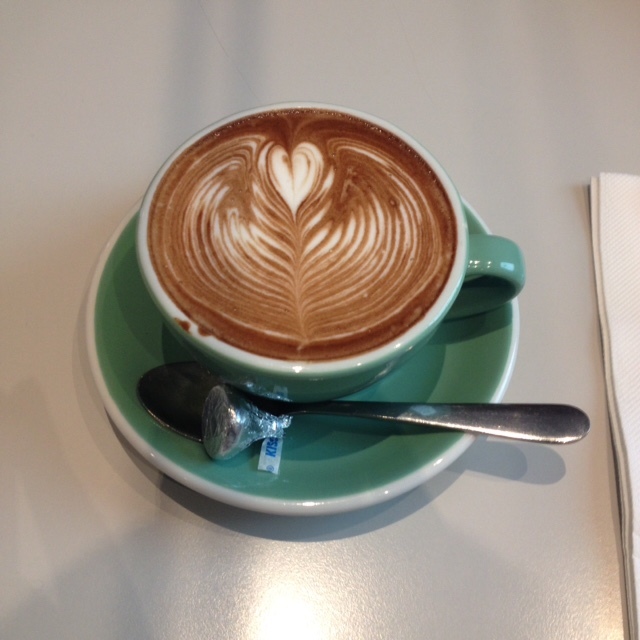 My hot chocolate was thick and had just the right amount of sweetness; a good complement for the hot cakes. Now, was I conned? You be the judge: I wasn’t served the grilled pears and only realised this when I was looking at the menu after I had gotten home. I also remember that the diners sitting next to us had the grilled pear on their plate… What happened to mine? I would have also preferred if the other additions were not served in crumble form; actual dark chocolate chunks please! A’s sweet potato and corn fritters was a very tasty, savoury dish; if I didn’t know better, I’d have said there was meat in the fritters. The dish came with poached egg which is definitely not my thing, I like my eggs hard-boiled with grey yolks. I do not want to see any yolk in fried eggs too. I also expected the fritters to be pancake shaped but I have since learned that fritters aren’t always round. 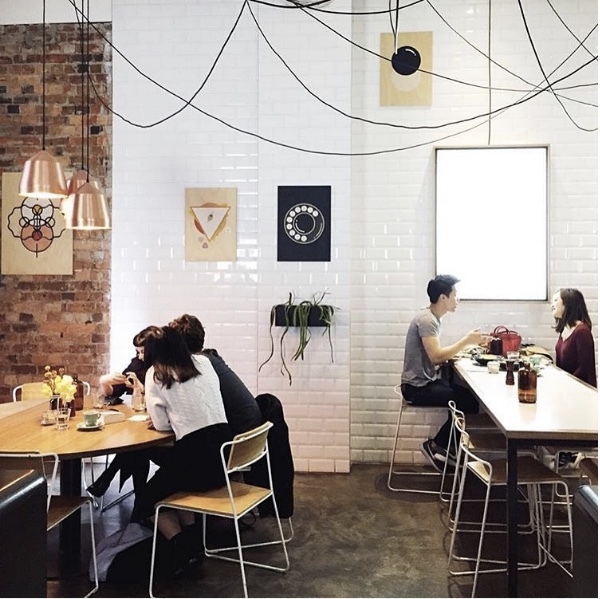 Operator 25’s a good place to go to with a small group of friends, order lots of dishes and try them all together! It seems to be a popular place among the young Melbourne crowd too. I would definitely like to visit again and if I happen to order the hotcakes, I’ll be sure to look out for my grilled pear! Do you now want to make these hotcakes at home? Ayamstuffed has found a recipe for you! This recipe is for pancakes though, but I believe they’re pretty similar to hotcakes. Enjoy! 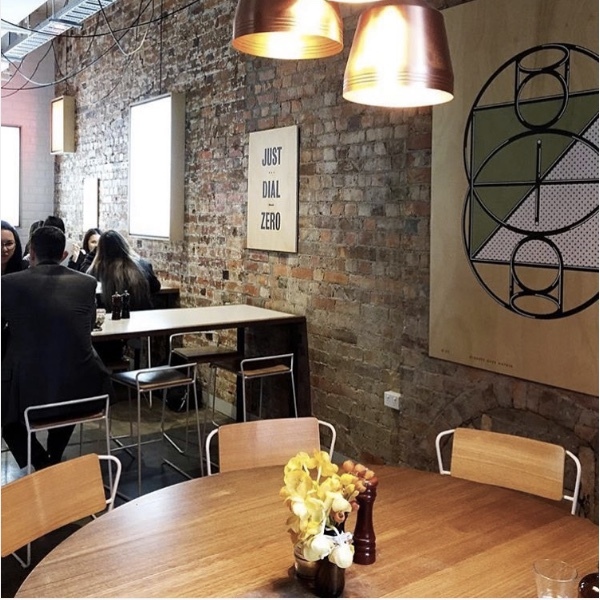 Operator 25 is located at 25 Wills St, Melbourne VIC 3000, in a building that apparently housed Melbourne’s first switchboard. Great name choice! Go back and ask for your grilled pears.